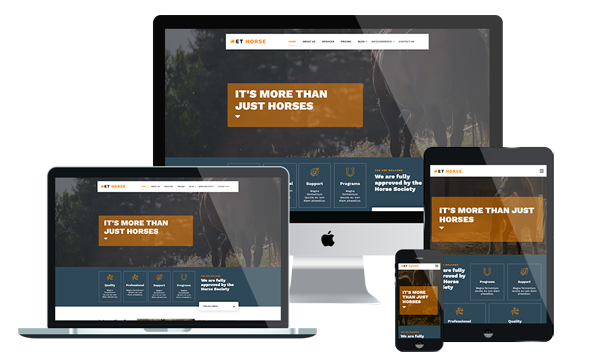 ET Horse is Responsive Equestrian Joomla! template that targets for horse farm or club websites. Our Horse Joomla! Template uses high-quality images to show viewers that you share the same passion and affection for horses. Horse lovers will definitely appreciate the images and the excellent content organization. It builds with latest Bootstrap CSS Framework, Support Font Awesome and K2 extended style. The main slider promotes products and services as soon as the viewer lands on your page, and the main menu offers a smooth and natural browsing system. Horse Joomla Template is completely responsive and supports cross-browser compatibility, which allows the viewer to access your site from all types of devices. Make use of the gallery feature to show all the pets available in your establishment immediately. If you’re searching for other solutions to put up a site, the website builder can be perfect for you.